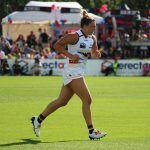 IN Round 4 of the AFL Women’s, Adelaide’s Danielle Ponter and Collingwood’s Sarah Dargan joined the list of growing Rising Stars in the competition after impressive performances on the weekend. Ponter was well deserving of her Round 4 Rising Star nomination in Adelaide’s victory over Fremantle. 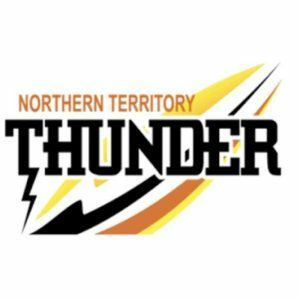 As Adelaide’s first nomination this season, Ponter took centre stage with two majors and a 90 per cent disposal efficiency on her home turf in Darwin. She also secured eight disposals and a mark in her first stint up forward. Teammate, Jess Foley (24 hit-outs, 13 disposals, five marks, two clearances and five inside 50s), also continued her elite form as she finishes second in the league for hit-outs. 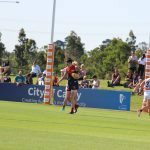 The Grand Final rematch went well in Brisbane’s favour as they kept the Bulldogs goalless in the first half. Along with teammate, Jesse Tawhaio-Wardlaw (12 disposals and six marks), Dowrick was both dominant in the air and in the contest. For the day she had 12 disposals, four marks and three tackles on her way to 58 AFL Fantasy Points. If Brisbane’s recruits continue to combine well, they could be the difference for a successful 2019 finals campaign. Prespakis continues to be one of Carlton’s most dominant utilities, impressing in the loss. With both teams underwhelming on the scoreboard, the No. 3 pick showed she’s nothing if not consistent as she picked up a game-high 19 disposals, one mark and three tackles along the way to 67 AFL Fantasy Points. At the rate she’s progressing, it might be possible for her to snag the Rising Star Award and the AFLW Best and Fairest trophy in consecutive years. She is easily the frontrunner for the latter, but also shouldn’t be ruled out for either as the continues to put up great numbers. The hardnut midfielder is getting better by the week, and in Round 4, she was handed a Rising Star nomination. Against the GWS GIANTS, Dargan racked up 16 disposals, two marks, six tackles and booted an important Collingwood goal. She was the second highest disposal winner from the Pies and has been a shining light in a disappointing season thus far. With a final quarter blitz shaking Fremantle to their core, Duffy and Parris Laurie were treated to their first loss as Fremantle players. Of the two, Duffy had the most impact. Despite recording her lowest numbers of the season, Duffy endeavoured with seven disposals, three marks and two tackles. She tried her luck at a goal in the fourth but failed to find the middle. Laurie (eight disposals, two marks and one tackle) remained efficient in the loss. Geelong’s hard ball winner continues to impress in Nina Morrison’s absence, propping up numbers all over the stat sheet. In the Round 4 victory she secured 14 possessions (nine contested), three clearances, three tackles and four inside 50s. Her work on the inside continues to impress, but her disposal efficiency (42 per cent) could improve. Not only has Bonner proven to be the GIANTS’ most dominant new prospect, at times she warrants comparisons with some of the league’s best. She is yet to be goalless this season, kicking her fourth career goal with elite goal sense. As a forward, she possesses a lot of the footy as she combines well in chains and hits up teammates in space. For the game she snagged nine disposals, one mark and one tackle. While not her most impressive game, she still deserves her place on this list. Hanks might have been one goal short of a Rising Star Nomination this week as she turned it on for Melbourne in a tight loss. 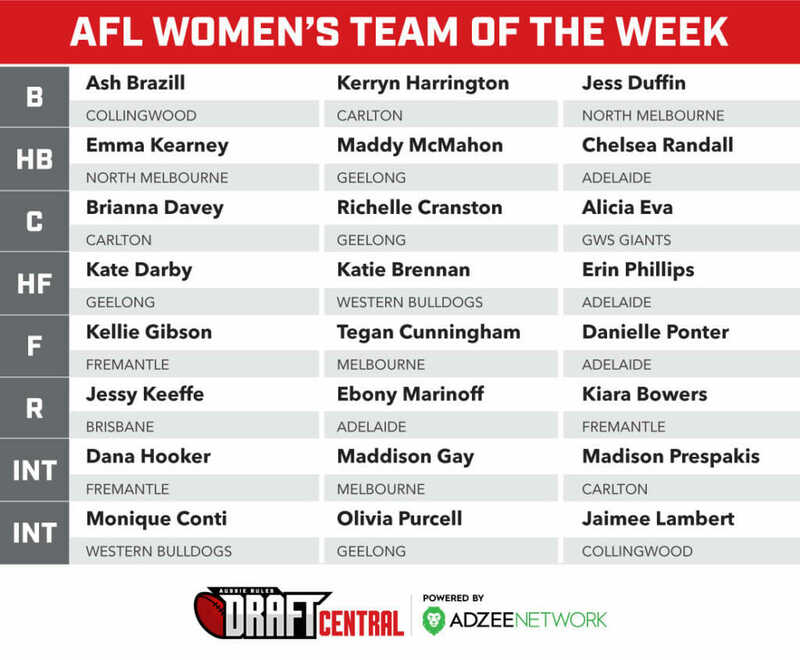 The former Gippsland co-captain decisively made her case for Rising Star consideration with 12 disposals, one goal, two marks and three tackles on her way to 51 AFL Fantasy Points. This marks Hanks’ second goal and third consecutive game with over 10 disposals. There was not a lot of first-year influence in North Melbourne’s fourth consecutive win, with most players recording under four disposals with low disposal efficiency. Nanscawen was the best of the crop with four disposals, one mark and one tackle. In her first year, the 26-year-old is still yet to breakout, though with a solid team around her, it could still happen this season. The Irish-born Bulldog was one of the few pillars who remained in their heavy loss. McCarthy had 12 disposals, two marks, two tackles and kicked her second career goal on her way to 53 AFL Fantasy Points. The change in codes has not seem to have dwindled her impact as she continues to get more comfortable in front of the sticks. IN Round 3, forward Courteney Munn booted four goals on debut and highlighted a number of impressive draftee performances across the round. The South Australian champion exceeded her Round 1 performance in a big win over Geelong. 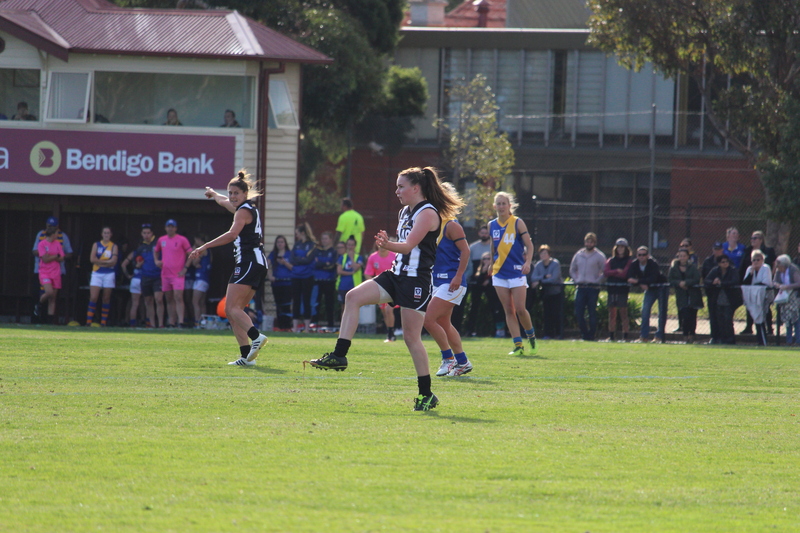 She kicked two goals, with her last comfortably shutting the Cats out of the race in the final quarter. Her work overhead remains consistent as she leads well into space. She also displays an uncanny goal sense that makes her dangerous around the sticks. For the day, she tallied up 13 disposals, four marks and three inside 50s, as well as finishing as Adelaide’s second leading goal kicker behind Erin Phillips (three goals). After missing her first shot on goal against Fremantle, Tawhiao-Wardlaw found her first in her side’s loss to Melbourne, coming at the end of a first quarter which seemed to be keeping Brisbane in contention. Unfortunately, those hopes were quickly quashed as Melbourne returned five consecutive goals in the second. For the day, Tawhiao-Wardlaw had eight disposals, three marks and two tackles. A contender for the MVP, Prespakis has somehow smashed expectations with possibly a league-best performance against GWS GIANTS. After earning a Rising Star nomination in Round 2, the Carlton recruit took things up a notch with a game-high 21 disposals and three goals. She boasted an excellent goal sense and found her forwards well, combining well with Tayla Harris (three goals) on several occasions to hit the board. Her individual performance saw Carlton to their first win and possibly a revitalised season with a new brand of attacking football. Allen continues to improve despite Collingwood’s struggles. The former Dandenong Stingrays captain received her first shot on goal and a career-high 10 disposals alongside one mark and two tackles on her way to 33 AFL Fantasy Points. After a shaky second round performance, Laurie doubled her efforts with a 17 disposal game, smashing her previous highest. The 24 year-old made waves throughout Fremantle’s midfield, assisting attacking chains and dishing the ball off effectively. She finished as the second highest accumulator behind teammate, Kara Donnellan, and currently sits at a 77 per cent disposal efficiency, looking set to take the game on more in the coming rounds. Despite some issues with her disposal efficiency (37 per cent), Purcell currently sits as Geelong’s best young asset after Nina Morrison suffered her anterior cruciate ligament (ACL) injury. 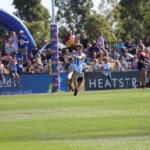 In her junior career she was selected for both TAC Cup Team of the Year and the All-Australian team and received the Geelong Falcons best and fairest during her under 18’s year. She brings Geelong a new level of intensity on the inside, dishing the ball out from congestion and bringing players to the ground. Against Adelaide she had nine disposals, one goal, one mark and two tackles. This was Purcell’s first score for the season and hopefully leads in many more. In only her fourth game of AFL, Bonner is playing like a veteran. In their loss against Carlton she remained a pillar in the forward line, marking everything that came her way and setting up multiple goals for her teammates. She also earned herself an early nod at the goal of the year with a gather and round the body snap from the boundary line. 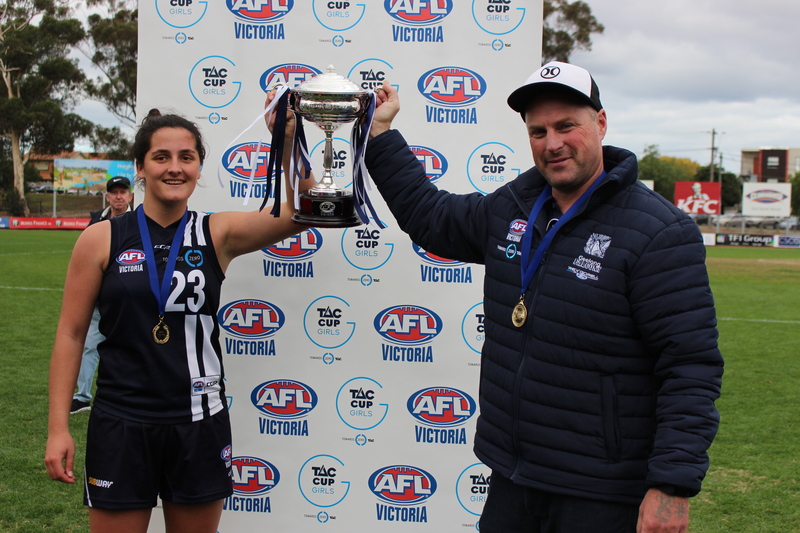 She assisted Christina Bernardi twice in front of goal and kept up the intensity despite Carlton’s dominance. For the day she tallied up 13 disposals and eight marks. The Gippsland Power and Carlton VFL gun was pivotal in Melbourne’s interstate win over Brisbane, with a career-high 12 disposals, four marks and three tackles. She dropped the ball in well to her forwards (three inside 50s), helping to assist Melbourne’s relentless goal pressure. She currently averages 10 disposals and 57 per cent disposal efficiency, but those numbers have only climbed since her debut. The debutant just showed another string to North Melbourne’s impressive forward bow, booting four goals in North Melbourne’s big win over the reigning premiers. Munn had 11 touches, four marks and two tackles in the victory, but it was her four goals, some of which were very impressive and showed maturity beyond her years. Her elite 91 per cent disposal efficiency was also a highlight and Munn certainly cemented her spot for Round 4. 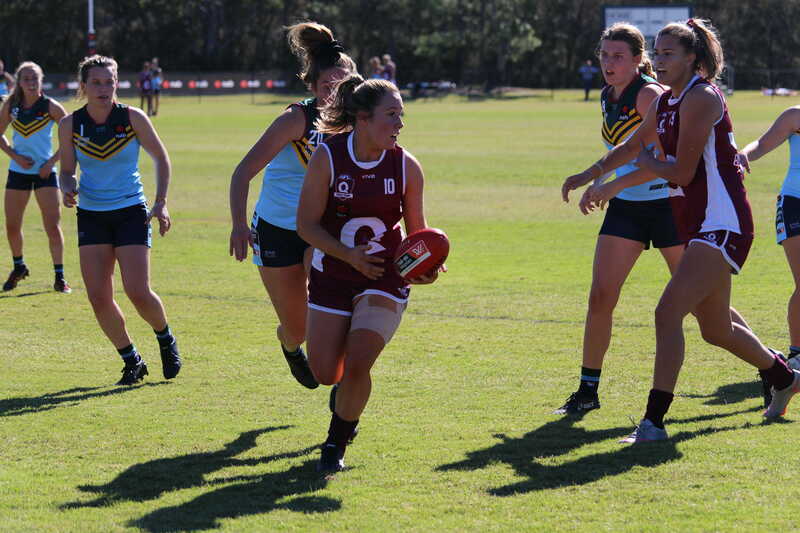 Moody continues to prove herself a dominant ruckman as she beat out her Roos opponent, Emma King, in the weekend’s loss. With 15 hit-outs to 11, Moody has shown she knows how to scrap with the best, notching her average up to 11 after a weaker performance in Round 1. In the loss, she picked up four disposals, one inside 50 and two clearances. Moody is well on her way to a big career if she keeps improving like this.